Wow! Look at This Huge Selection of Mattel Toys! everything you could ask for in the way of gift ideas and bounty for yourself, you can choose from action figures, mini-figures, dolls, playsets, construction toys, games, role-play items, and more. 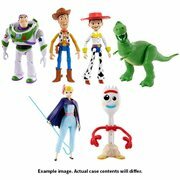 The company also provides merchandise under license from some of the world’s most famous properties, and many of the firm's products have become such a part of our culture that one would be hard pressed to find any adult who hasn't owned or played with Barbie, Fisher-Price, Monster High, Thomas & Friends, or others in the myriad of available playthings. And guess where you can find them. Right here at Entertainment Earth! Grab your share of the hundreds of ultra-cool Mattel products below and join in the fun! As one of the largest and best-known toy companies in the world, this manufacturer says it's "Creating the Future of Play." Who can argue with that? Offering virtually everything you could ask for in the way of gift ideas and bounty for yourself, you can choose from action figures, mini-figures, dolls, playsets, construction toys, games, role-play items, and more. The company also provides merchandise under license from some of the world’s most famous properties, and many of the firm's products have become such a part of our culture that one would be hard pressed to find any adult who hasn't owned or played with Barbie, Fisher-Price, Monster High, Thomas & Friends, or others in the myriad of available playthings. And guess where you can find them. Right here at Entertainment Earth! Grab your share of the hundreds of ultra-cool Mattel products below and join in the fun! 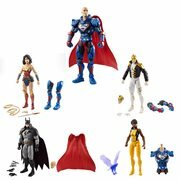 Among the many licensed products in Mattel's supersize stable of sensational stuff you'll discover dinosaurs, mini-figures, and playsets from Jurassic Park and Jurassic World; DC Comics, Batman, Superman, Wonder Woman, Aquaman, Justice League, and Suicide Squad-inspired goodies like action figures, plush, games, masks and other role-play essentials, and of course, Hot Wheels; track sets, X-Wings, TIE fighters, and starships from the Star Wars saga; playsets, Mega Blocks, and blasters based on the popular Halo sci-fi video game franchise; Mega Construx Poke Balls you can build, derived from Pokémon; and a wealth of playsets and fun-tastic vehicles featuring the amazing characters in the Disney-Pixar Cars film series. These "Playthings" Are Not Just for Kids! Children aren't the only ones who draw enjoyment from the multitude of entertaining products pouring out of the El Segundo, California-based company's warehouses. Championship belts, plush, and wave upon wave of must-have WWE Basic, Superstars, and Elite Collection figures featuring pro wrestling celebrities like Dwayne "The Rock" Johnson and John Cena are much in demand by collectors. And then there are those long-time admirers of that ever-popular brand of die-cast metal and plastic cars, trucks, construction toys, and more that was introduced by Lesney Products in 1953 and known ever since as Matchbox. As you can see from the enormous selection of wonderous items above, our website is a terrific place to land when you're in the market for a gift for someone you love or a reward for the person who's reading this sentence right now. Be it an American Girl mini-figure or playset your little darling just can't live without, a fun new contest for game night with the family, or a mask or other role-play addition to your can't-miss costume for Halloween or that next office party, set your sights on Entertainment Earth for the fabulous Mattel merchandise you know will not disappoint!